GREG HAMILTON. The New Class War – Part 1: Foundations. Humanity had a chance to avoid the class war now raging. It might have come from The Harvard War that was fought and lost in the early 1930s. Hardly noticed at the time, it gets no mention today, yet it had the most profound impact on our civilization of any since the ructions in Judea of yon. It sounds melodramatic but it’s true. The defeat sustained by Western civilization wasn’t—and still isn’t—recognised as a death knell, and a tragic one. It was, and still is, embarrassing to talk about spiritual matters, the core of our conscious being. The current social class war is, I submit, the result of the loss of the Harvard War. It involved a Faustian transaction in which humanity sold its soul. To explain today’s malaise in society without emphasis on the rout at Harvard is to miss the essence of it. Ignorance of the subject in Postmodernist academe is due to the difficulty hard-nosed Western man has in dealing with matters of the spirit. He’s lost the poetic gift. He suffers from a shonky education and CWS (chronic withered soul syndrome). “It is also the crisis of contractual (capitalistic) society associated with it. In this sense we are experiencing one of the sharpest turns in the historical road. Not a single compartment of our culture, or of the mind of contemporary man, shows itself to be free from the unmistakable symptoms.” We chose what was easy, not what was right. And, suffering the consequences of that sell-out, we muddle on deeper into existential angst and loss of hope. The crisis Sorokin described is in its final act in our time. We’re going to experience traumatic change in the near future, or sink into the new Dark Age Jane Jacobs wrote about. So far, the latter seems the most likely. And it’s unfolding in a state of generalized ignorance about what’s actually happening. Unless our leaders tell us what’s at stake in our lives, we’re likely to remain ignorant. In a nutshell, Capitalism is going the way of Communism, only with far more destructive consequences. Both models were defective because inauthentic, therefore destined to disintegrate. The GFC of 2008 sounded the death knell of our capitalistic system when we responded by pumping in more oxygen, ignoring the causes, knowing it was giving it more gas to augment the final explosion. According to Sorokin, there are two fundamental cultural patterns: materialistic (Sensate) and spiritual (Ideational). Societies tend to alternate between the two. Times of transition from one orientation to another are characterized by many wars and crises and social injustice of the type growing worse in our time. What’s being painfully replaced is the conviction that only the material world is real; that there is no other reality or source of values. Paradoxically, it’s science, not religion, now telling us that our material concept of reality is an empty illusion. Things really exist at an invisible energy (spirit) level, including ourselves. They discovered this over a hundred years ago but we were too busy banging the fertilizer out of each other to notice and do something about it. In 1901, quantum physicists discovered that we’re no more real materially than the Lone Ranger images flowing through the tube of an old HMV television set. Sorokin expounded his view that we balance our material existence with matters spiritual or we go under. That was the choice we bungled. Talcott Parsons, an arch-materialist colleague of Sorokin’s in the faculty created by Sorokin, led the charge against him and his message. Parsons validated the money-runs-everything society we inherited from that period, spawning the likes of Milton Friedman and Thatcherism (what we in Oz know as economic rationalism). Talcott Parsons, with an inferior mind (read soul) and social theory, won the battle and the war by numbers, and the rest is history—proving yet again that the lowest common denominator is what rules human affairs and guides human destiny. No man or woman gutted in spirit can have a genuine understanding and appreciation—or love—of the value of human society. (Make no mistake: it’s about love, which we consider corny). Yet the management of society is now in the hands of such loveless people. Gutted of spirit, the only measure or standard available to them is the dictates of Mammon and the baser instincts. The pertinence of this battle of the minds to the present world-wide class war lies in the fact that Australia at its best—under Curtin and Chifley—benefitted from a balance of matters material and spiritual. In the 1960s, if you suggested you play sport just for the money you’d have been thought mentally retarded. Today, if you think the reverse you’d be considered deranged. Everything today is underpinned by copious layers of spin spewing from pulpits, schoolrooms, media outlets and legislatures. It’s thanks largely to Talcott Parsons of Harvard and Milton Friedman of Chicago that this senseless and radical undermining of sound human values could be achieved in the short space of five decades of a hyper-destructive century. 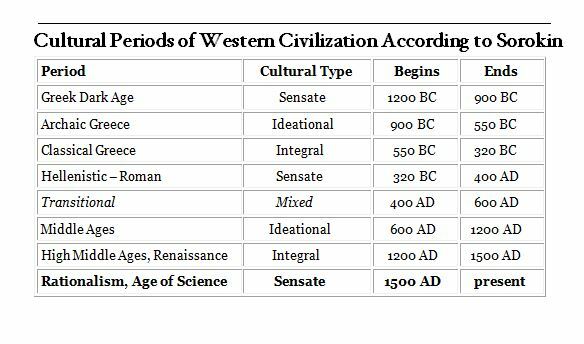 Sorokin’s table below shows three thousand years of variation in the nature of our cultural periods. The next phase in the cycles is for an integral cultural type akin to the highest period known to us—the High Middle Ages and early Renaissance. The change will be prolonged and traumatic, but it means humanity won’t have destroyed itself in pure folly, as so many now fear. 5 Responses to GREG HAMILTON. The New Class War – Part 1: Foundations. May I suggest the author view Interstellar directed by Christopher Nolan – if it is truly about ‘love’ he should relish this film. This is very helpful thanks Greg. I’m curious as to how Sorokin would define an “integral” culture and look forward to researching that further. The whispers of some new stories we need to tell are there if you listen deeply for them. There is hope embedded in your article Greg … for this I’m grateful. Many thanks Greg, this is a breath of fresh air. I hadn’t heard anything about Sorokin really, apart from his name – and I’ve just done first year sociology at UTas. You’ve definitely sparked my interest in him. And how I wish this kind of writing was the usual instead of the exception. Big question: What is to be done? What are the new stories that we need to tell? I can’t agree though, no matter how important Harvard thinks Harvard is, that a couple of academics had much material influence on what are vast psychic forces. History has its own dynamic and I imagine if those individuals hadn’t played the role that they did, then others would have. And these forces extend beyond the USA, the Anglosphere, the “educated” classes or any other category less than global humanity. Perhaps even beyond that as the field of karma is not so limited. None of the previous invalidates the historical cycles you outline, however. That particular model of history seems a lot more valid than others that make no reference to the “spiritual” dimension of human existence. Also more obviously valid to anyone that doesn’t fully buy in to the materialist paradigm. It is more accurate to say that quantum physics holds that it is “consciousness” that is fundamental and of the highest order of Reality, rather than “spirit” or “energy”. Not any individual consciousness, but consciousness without differentiation, without subject or object. The five-sense world as we perceive it, “physical reality”, does not exist until it is perceived. It is real, but not ultimately real. Just as a dream is “real”. You did have a dream and when you are in the dream it “seems” real. “Physical reality” is in fact a virtual reality, not in any metaphorical sense, but literally. The world is digital information running according to a rule-set (physics) in the “computer” of the larger consciousness system, that is “outside” this limited reality. Those we have historically called mystics, saints or avatars came to exactly the same conclusion by the method of directly accessing higher consciousness and thereby gaining an external perspective on “physical reality”, the World. Those that say quantum physics is “just” a theory do not understand that everything in science is a theory. This simply allows the possibility that new evidence may be discovered that requires revision or adaptation of the theory. Science is a limited intellectual exercise and does not (properly) pretend to absolute knowledge. That is rightly the sphere of mystical insight-knowledge. However quantum theory has now been tested experimentally many thousands of times and many technologies are based on it that work exactly as they should. Though, even if there were just the double slit experiment, that would be enough to undermine materialism beyond recovery. Institutional Science simply has not integrated what is, as you say, explicitly proven by quantum experimentation, that there is NO valid basis for the assumption that the world is materialistic and/or deterministic. To accept the validity of quantum mechanics yet act as a materialist is double-think, pure and simple. That is wonderful stuff, thanks Greg — and John for providing the space. I was trying to recall where I have read about Talcott Parsons recently and it may have been Pankaj Mishra’s book, Age of Anger. The author blamed Parsons at Harvard for separating sociology from economics. The Post is spot-on and I look forward to the next instalment.